For this upcoming 2017 season, the men’s soccer program may hire another new coach, or bring back interim head coach Darren Leslie. The men’s soccer program reflects on its past as it gets ready for potential changes, 33 years and nine coaches later. The first men’s soccer team in the history of CSUSB athletics was put together in 1984. 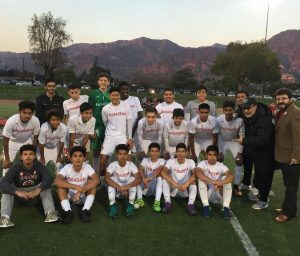 Led by head coach Cherif Zein, the newly formed Coyotes proved to be successful with an 11-2-0 winning record on the season. Zein is currently still very involved with coaching soccer. He coaches for a club, CZ Elite, as well as for Pasadena High School. The men’s soccer program started off competing at the Division III level. It was not until 1991 that the program advanced to compete in Division II. From 1985-1993, the men’s squad was coached by Carlos Juarez. Juarez spent eight seasons with the program, helping them make two appearances in the National Collegiate Athletic Association (NCAA) tournament in 1987 and 1991. Juarez had experience playing for Cal State Los Angeles, as well as professionally in Mexico. He is currently a National Staff Instructor and a lead scout for the U.S. Men’s National Team. The National Instructional Staff consists of top coaches from across the country who are highly advanced in coaching education. “The first time I got a full time job coaching college soccer was very important to me because that’s when I realized that I could make coaching my profession,” Juarez told US Soccer during an interview in 2014. “Coaching at the college level gave me the opportunity to teach and coach. It expanded my ambitions of becoming a paid professional as a coach,” added Juarez. In ‘94 the program was taken over by Bret Baker for a single season, but Juarez returned to the head coach position from ‘95-‘96. Juarez was one of the most influential coaches for the men’s team, not only taking the team to their first and only California Collegiate Athletic Association (CCAA) championship, but he was also with the program when it advanced to Division II. From 1997-1999 Mike Avery took on the head coach position. For the following 4 seasons, from 2000-2003, Christian Johnson was appointed as head coach. Under Johnson, the team struggled, earning a record of 31-45-4. Noah Kooiman was the next coach to take over the program from ‘04-‘11. Kooiman has experience playing for Cal State Fullerton, being named team captain his junior and senior seasons. He also played two years of professional soccer in Los Angeles. Under Kooiman the Coyotes struggled to earn a single winning record for 5 seasons straight. However, they showed drastic improvement in 2009 and 2010, earning an overall record of 28-12-2 and appearing in the NCAA tournament both years. “The past eight years have been the absolute highlight of my professional career,” said Kooiman. “We’ve enjoyed great success and helped put Coyote soccer on the national map,” continued Kooiman. “Noah built the men’s soccer program into a nationally-recognized program and we’re on solid ground because of his efforts,” said Dr. Noah Hatcher, the former Athletics Director, during an interview in 2012. Lance Thompson was the next in line to become head coach for the men’s squad in 2012. During Thompson’s single season with the ‘Yotes, they earned an overall season record of 5-5-7. In 2013 Travis Clarke stepped in, but the ‘Yotes came out with a losing record of 5-12-3. Still striving to make a name for themselves and determined to work through struggles, the program brought in a new coach, Steve Ralos. Ralos coached from 2014-2015 and earned an improved record of 13-14-5. The team’s most recent head coach was Darren Leslie who started out as an assistant coach for the ‘Yotes in 2015 and began his first season as head coach last year. Leslie moved to the United States from Scotland in 2011. He has experience coaching the semi-professional squad Club Marin in Northern California. The final decision on who will be head coach for 2017 should be announced sometime in February.